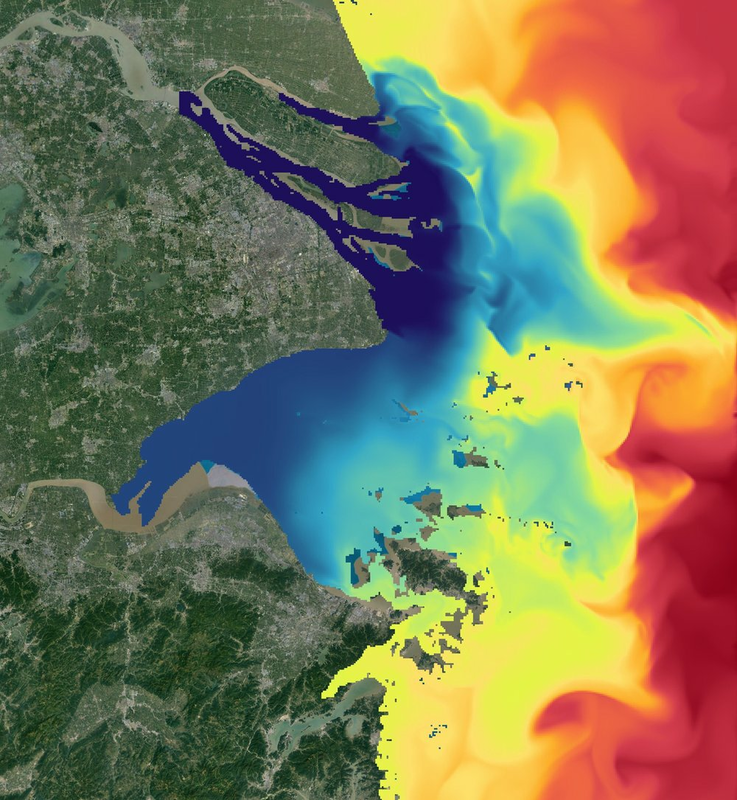 MetOcean Solutions recently completed the development of operational high-resolution wave and hydrodynamic models for the Yangtze River mouth and coastal areas off Shanghai. The work combined cutting-edge science within our agile operating system to set up wave and current models for Hangzhou Bay, a region within the East China Sea which is partially enclosed by the Ryukyu chain of islands. Bathymetry of the East China Sea. Red dots show the locations of measured data used to validate the models. Progressive downscaling of outputs from MetOcean Solutions’ global wave model WAVEWATCH III using two SWAN nests. Snapshot of surface salinity from the ROMS model. Blue denotes low salinities; red high. The SWAN (Simulating WAves Nearshore) model was used to resolve the wave climate and the Regional Ocean Modeling System (ROMS) was applied to simulate the circulation. Quantile-quantile plot comparing measured and modelled significant wave height (Hs) for wave hindcast using (black) existing CFSR wind fields and (red) adjusted wind fields to correct for observed wind bias. “High-quality input data sources are critical to running wave and hydrodynamic models in such complex settings,” continues Rafael. “We found persistent wind speed bias near the bay in the global reanalysis data source that we used to calibrate the high resolution models. Correcting this bias before running the wave model significantly improved model results just offshore of the bay as shown in the comparison of measured and modelled significant wave height. The area has heavy shipping traffic, and the operational system outputs, including 7-day forecasts of site-specific waves, winds and currents, are now available to marine users. Please contact us and we will connect you with our partner agency in China.